Purchased this for occasional home scanning, and really like the fact that I can store it away in its pouch when not in use. I use a Mac Book Pro and I really like the way that it hooks up so easily and produces good images, and the fact that you can preview pages before saving and deleting those you do not want. I have not really put the unit through its paces though, but I am very pleased with the small amount of scanning I have done so far. My only reservation is the paper auto feed mechanism - does not seem to cope very well with multiple sheets and I have to feed one by one some times, but as I say, I have not done loads of scanning yet, so only time will tell. Overall, very pleased with the purchase, and I found Trade Scanners to be really helpful when I phoned to enquire about the product - no hard sell. Rated a 4 instead of a 5 due to paper feed issue. Found the scanner easy to set up and use when I got it - unfortunately the reason I got it the first place was to meet a work requirement in a hurry and then didn't need to use it in that capacity - so not really used it in anger yet! The buying experience with tradescanners has always been an easy and pleasant experience, products are delivered swiftly. I bought this scanner for use in our property investment firm. We have a main scanner for doing bulk documents already. I chose this scanner as it is portible and has a small footprint on my desk. It is perfect to tackle the low-medium volume of documents that I need to back up. I found this scanner to work perfectly. The software integrates simply and I had no problems. I have used it on a PC and on MAC. It is portable enough to take to out of office meetings if required. For the type of work I do I would recommend this scanner and if it was stolen I would buy the same to replace it. The scanner is small, compact and very robust. I was amazed at how quickly it pulls pages through and I have not had any problems with it. Quite a work-horse and gets the job done. I bought it for a specific task, but now use it for all my scanning. Excellent product, great service - exactly what I needed. This scanner is one of the best investments I have made. Having used flatbed scanners for years which are much cheaper I was a bit worried by the price tag. From out of the box the P-215 worked brilliantly, without any software needing to be loaded or drivers installed. I have a lot of job sheets which need emailing which are not always in the best condition. Even if the job sheet is crumpled or has a corner torn off, the end result is better than the original! It also automatically scans the other side of the job sheet if you have written notes on it. 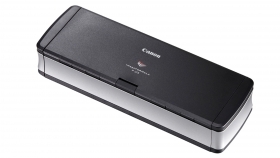 High-speed, mobile document scanner for the office, for home or on the move. Most productive USB-powered scanning The imageFORMULA P-215 is the most productive scanner in its class. With double-sided scanning speeds up to 30ipm and an industry-leading 20-page automatic document feeder users can scan efficiently, in the office, at home or on the move. Full-rated scanning speeds can be powered via just a single USB cable using a USB 3.0 interface. With a sophisticated smart silver and black design, the ultra-lightweight, compact P-215 is ideal for the office. Its small footprint allows the scanner to fit comfortably on the busy desktops. True plug-and-scan is possible by simply connecting the scanner to any PC or Mac. Canon's unique built in CaptureOnTouch Lite software is ready to go – there's no need to load drivers or application software.